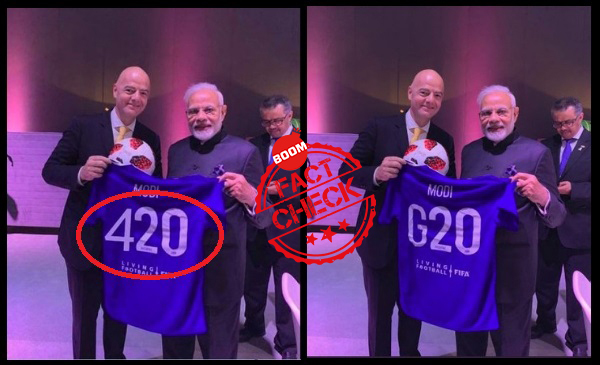 The football jersey gifted to PM Modi by FIFA president did not have 420 written on it. 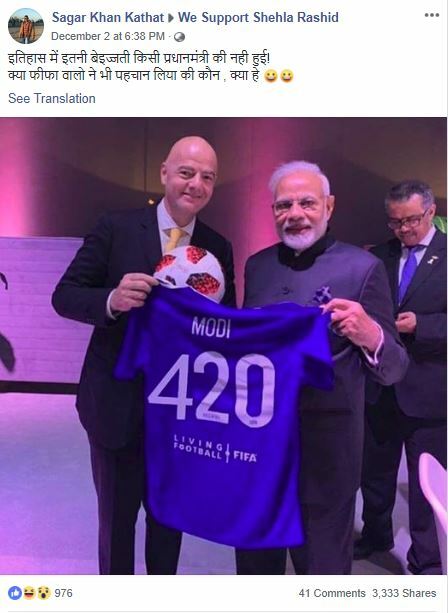 A photoshopped image of Prime Minister Narendra Modi receiving a football jersey with ‘420’ written on it is being widely shared on Facebook and Twitter. 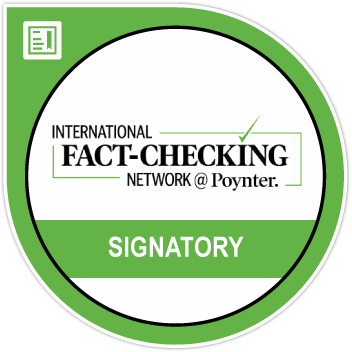 A fact check reveals that the image was shot on the sidelines of the G-20 summit held in Argentina and the jersey had G20 printed on it. In colloquial satire in Hindi, 420 (Charsobees), is used to refer to a person as a fraudster. Moreover, Section 420 of the Indian Penal Code refers to ,’Cheating and dishonestly inducing delivery of property’. The image has been shared on Facebook group We Support Shehla Rashid with the caption, “इतिहास में इतनी बेइज्जती किसी प्रधानमंत्री की नही हुई! क्या फीफा वालो ने भी पहचान लिया की कौन , क्या हे 😃😃”. This translates to, ‘In history, no Prime Minister has been insulted like this. FIFA has also recognized who and what people are’. Click here for the archived version of the post. Other Facebook pages and Twitter accounts have also shared the image with the hashtag #Modi420. This hashtag has been used in the past as well. BOOM found Facebook posts dating back to 2015 which has used the hashtag. जिसने यह टी शर्ट बनाया और नंबर चूज किया है उसे 121 तोपों की बेहतरीन सलामी !! 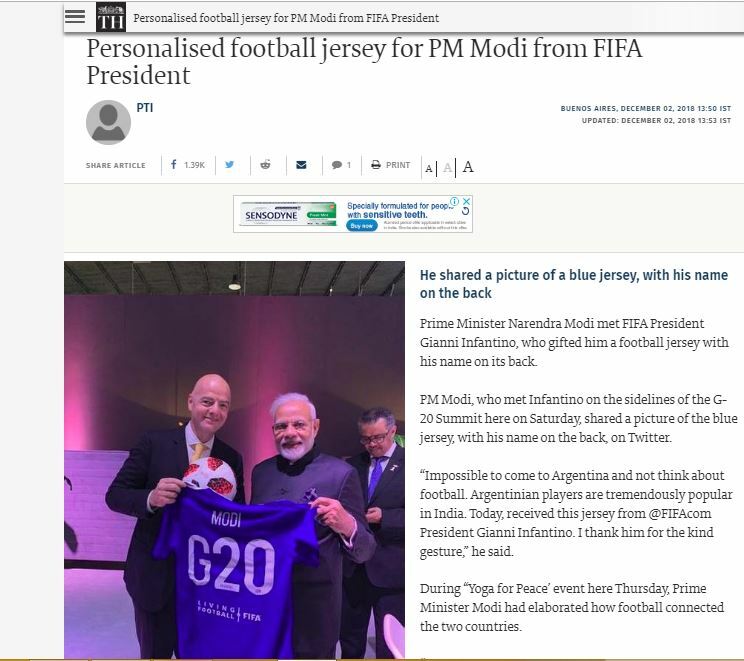 A reverse Google image search shows several articles reporting Modi receiving a personalized jersey with his name and G20 written on it. Below is an article by The Hindu published on December 2, 2018. The personalized football jersey was a gift to Modi by FIFA president Gianni Infantino when they met in Argentina on the sidelines of G20 summit held between November 30 and December 1, 2018. As seen in the image, the jersey had the text ‘G20’ printed on it and not ‘420’. Modi had also tweeted the image and thanked Infantino for the gesture. He also said, ‘Impossible to come to Argentina and not think about football. Argentinian players are tremendously popular in India’. Impossible to come to Argentina and not think about football. Argentinian players are tremendously popular in India.